Welcome to Custom Card Boxes! Note: CCB is going through a site redesign which is not finished yet. Many box options and prices have changed. Send an email for any price/product inquiries. 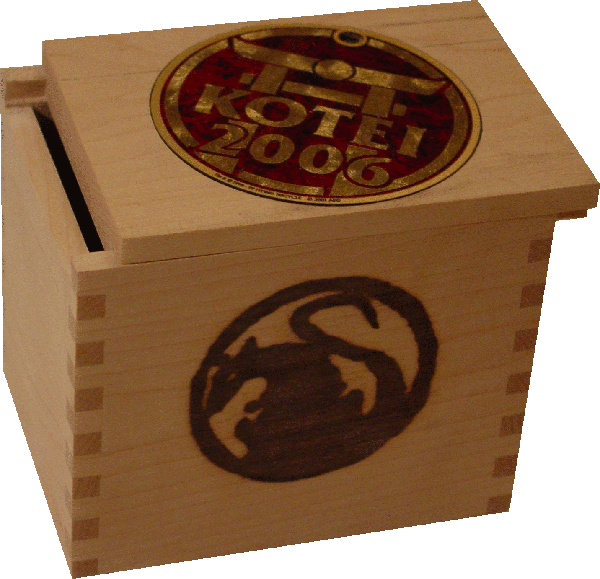 Here you can design and order a custom box for all your collectable card needs. 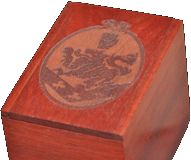 Our deck boxes are 3.5" tall and sized to hold most collectable cards in a protective sleeve. 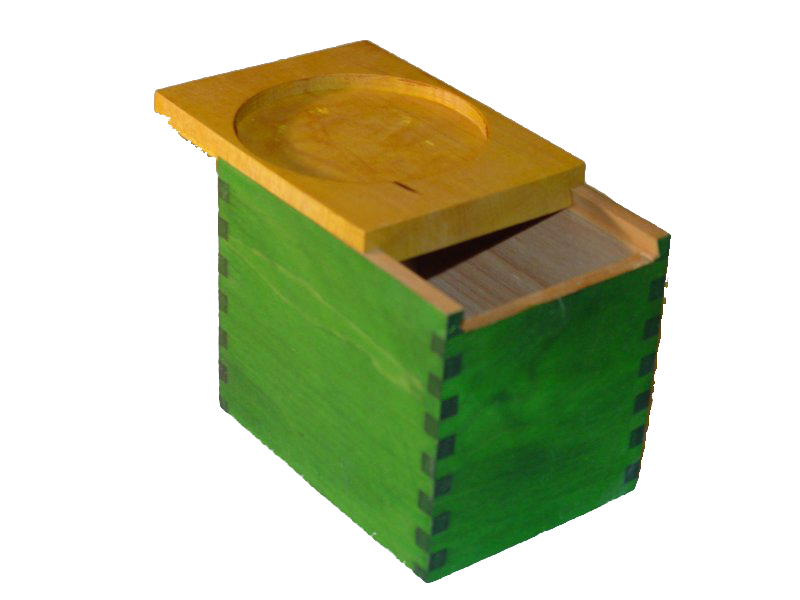 The sides are .25" thick, with a wide selection of woods available to choose from. 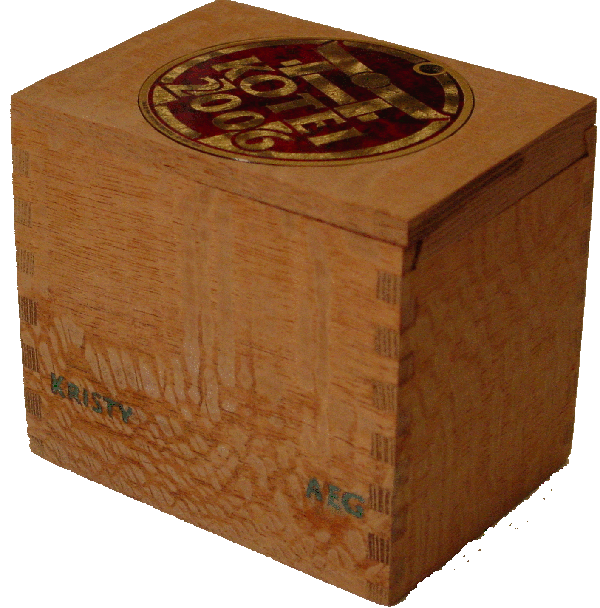 Combining the many wood choices with almost limitless inlay/branding options lets you create a truly unique box. Our storage boxes are sized according to your needs, with sides being approximately 0.5" thick. Whether you're looking for a unique box to hold your killer deck or for boxes for CCG tourney prizes, CCB.com can meet your needs. If you don't see what you're looking for on these pages, head to our Web Store and put together a box from the standard options, or you can contact us with your idea and we'll work to meet your needs. We've finally gotten some time to do some web updates. Check out the new gallery of storage boxes . We're still working on a full revamp, but in the meantime at least some updates are coming. 2013 finished strong and that's continued into 2014. Thanks for your interest, and we look forward to another record year. 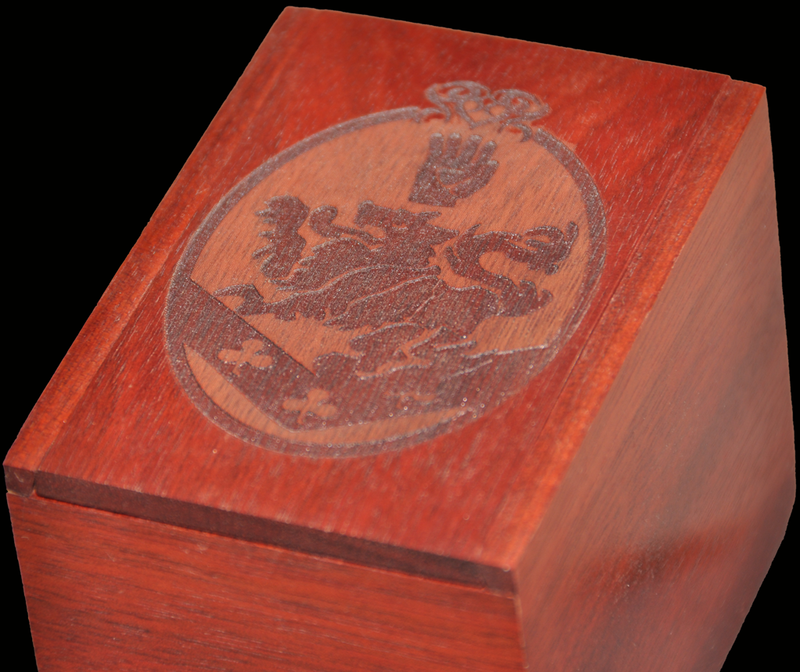 The strong demand has pushed our lead time out to 8 weeks on custom boxes. If you want a deck box, we keep some assembled but not finished. They can be quickly customized for you. We continue to have issues with SPAM- both incoming and outgoing. When you contact us, we always respond. If you don't receive a response, it means that your message got eaten by a SPAM filter - either ours or yours. So please check your SPAM folder and if it's empty send us a second mail. Also, if we respond to your inquiry and you want to think about it for a while, send us a "Thanks, I'm looking into it" just so that we know the message got through. Custom isn't just in our name, it's what we specialize in. So we work with you to create a box that's unique and which meets your needs. There are literally endless possibilities, and an online designer couldn't do it justice. Take a look at the gallery to see if there's a design you like, or if there's some other design you'd like we'll work with you to make it unique to you. We've actually pointed customers at an online box contest so they could find new ideas, then customized the basic idea to hold their MTG cube. Card storage boxes have really taken off in the last year. Each one has been custom made and it has been a lot of fun to work with our customers and create something unique that exactly suits their desires. Some of them have been large enough to hold over 3000 sleeved cards and have been shipped worldwide. 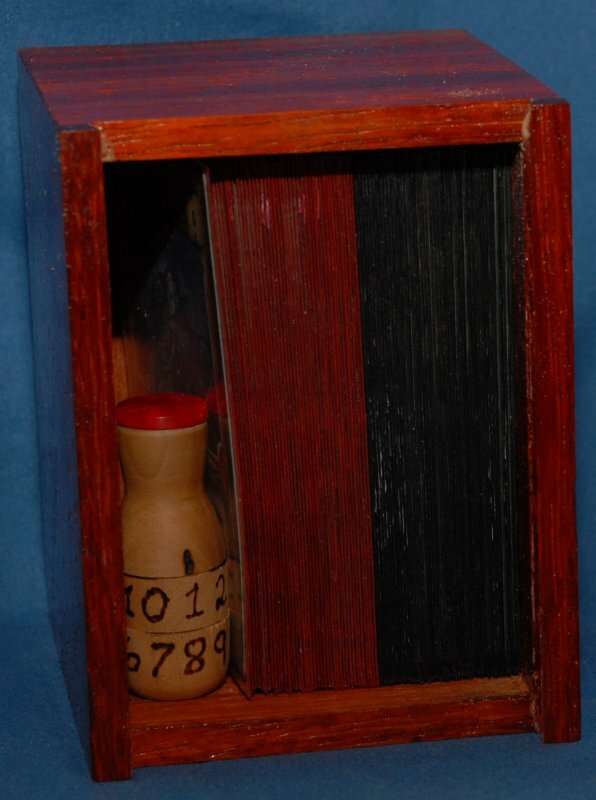 Several have had extra sections designed to hold odd-sized cards, dice, or pencils. 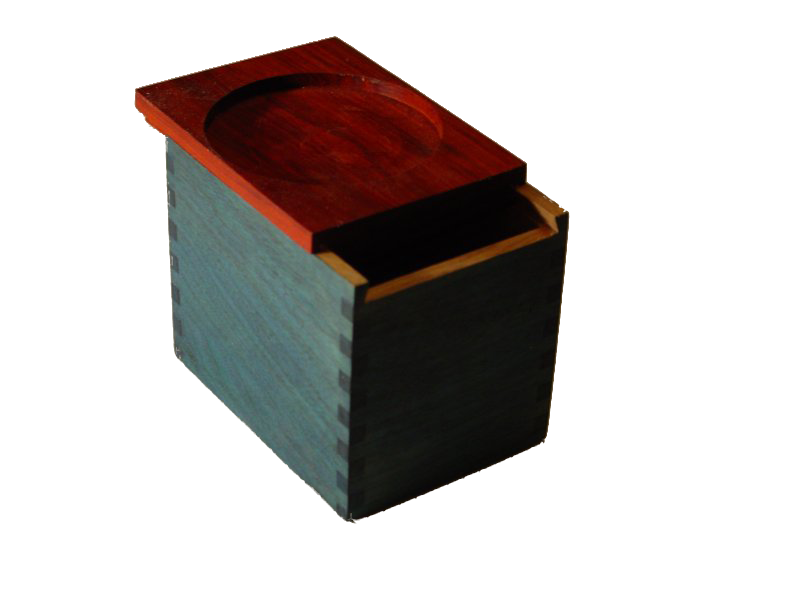 We've had the pleasure of working with our customers to create some super-custom deck boxes that include extra compartments to hold dice, counters, a player's sidebar, etc. One had a removable interior tray to hold the actual deck. As we don't have a license for the official MTG artwork from WoTC, we have developed a set of alternate artwork using public domain images. Check them out on this custom storage box where they were laser engraved and then color filled. We've gained access to a laser engraver, and so laser engraving is now being done in house. This means faster turn times for your custom boxes. Engraving custom artwork on a lid will typically run around $15- here's an example of a recent Magic the Gathering box. Artwork will need to be at least 300dpi to achieve good quality results. 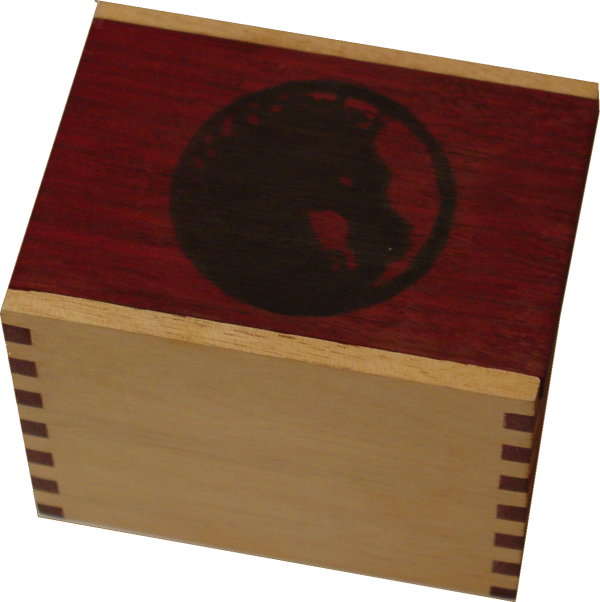 We recently got some great additions put up on the web store .All the major clans are up there in finished boxes, along with as-yet-unfinished boxes that you can customize. So you can choose your box, upgrade to a sliding honor counter lid, and put your clan mon on it. You can even order extra lids so you can use one box for multiple clans. We're pleased to announce that mitered corners are back. For woods wth highly figured grain, the smooth "wraparound" look that miters give is a great feature. 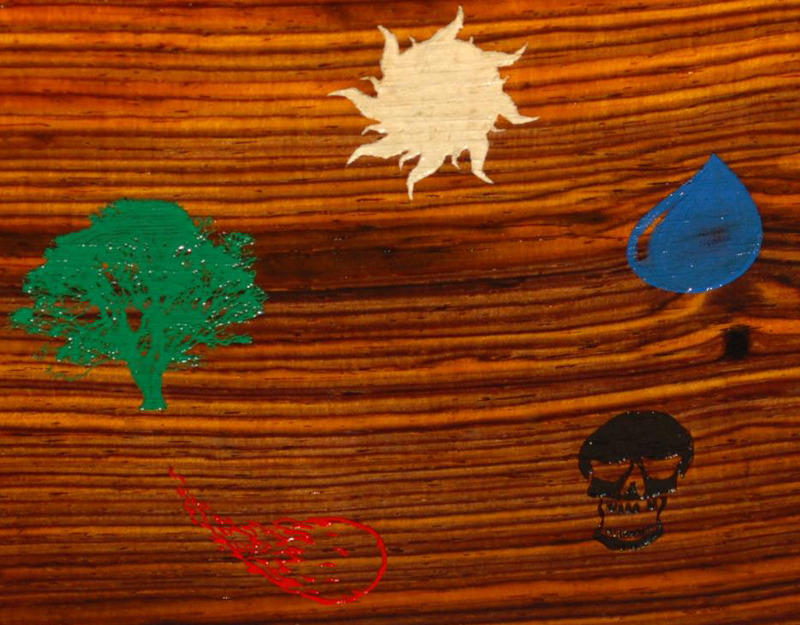 It also opens up new inlay opportunities check out the gallery for examples. You can choose either mitered corners (standard) or box-joints for the same price. Here's a picture of a counter in a box along with 85 cards in sleeves. This box is just wider than the sleeve- a card laid flat would have a little wiggle longways but almost none shortways. So ideally, this is as narrow as our boxes will get. It's an easy fit with 80 cards, a snug fit with 85. And there'd still be space on top for extra cards or other gear.